Named after the Greek hero Narcissus, whose love of his own beauty brought about his demise, all parts of the poet’s narcissus are toxic, especially the bulbs which can be easily mistaken for onions. It contains lycorine, so eating this plant can cause vomiting, stomach cramps, and in extreme cases, convulsions and cardiac arrhythmias. It is also highly fragrant and keeping a large quantity can bring about headaches and nausea. A fall flowering plant, autumn crocus offers showy blooms in hues of pink, purple, white, and blue. But beware, these lovely autumn flowers contain the alkaloid colchicines. With symptoms that are similar to arsenic poisoning, acute exposure is usually felt within two to 24 hours and includes fever, vomiting, diarrhea, abdominal pain, and possibly multiple system organ failure when left untreated. While it certainly is a fascinating visual piece for the garden, all parts of this plant contain cardiac glycoside, a digitoxin that affects the heart. If you eat it, it causes low pulse rate, nausea, vomiting, and heart contractions that will eventually lead to cardiac attack. This dainty little number is not only extremely toxic, but could easily be classed as an aggressive grower too. 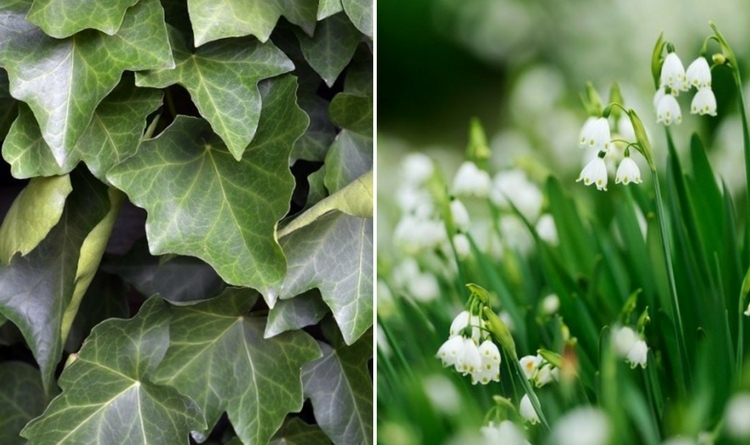 38 different cardiac glycosides have been identified in lily of the valley and consuming even small amounts can cause abdominal pain, reduced heart rate, skin rashes, and blurred vision. While its clinging vines make for an excellent ground cover or building façade green, using it anywhere else in the backyard can be problematic at the least. Despite their culinary uses and air freshening aroma, many varieties of mint – including peppermint, spearmint, and catmint – are prolific growers. Using their twofold spreading technique, mint plants are able to conquer far and wide via underground rhizomes and horizontal runners. Bamboos are one of the fastest growing woods in the world.They are producing more oxygen than average trees. Bamboo’s main caveat, however, is its vigor for colonizing new lands – it can (and will) spread beyond your property line and into your neighbor’s yard. Bamboo can be very difficult to cull and may take years to get it under control. With a common name like ‘creeping jenny’, it would be safe to assume that is plant likes to move! Though it is easily pulled from the ground, creeping jenny is better suited for containers or as a lawn replacement. Though exquisite to behold and superbly fragrant, all types of rose shrubs are finicky and need lots of pampering. For flawless blooms, you’ll have to ensure the soil is deep, loose, and enriched with compost, properly plan and space your plants so roses receive good air flow. Extremely temperamental, gardenias require a perfect harmony of watering, sunlight, humidity, feeding, pruning, and mulching in order to glimpse those showy white flowers come summer. If you neglect just one or two of gardenia’s needs the whole plant will suffer. Dahlias vary from teeny half inch pom-poms to enormous 10-inch “dinner plates”. Aside from the usual routine of watering and feeding, dahlias are prone to powdery mildew, botrytis blight, viral diseases, and tuber rot. Prolonging blooms means lots of deadheading and as dahlias grow and become massive they will need to be supported by stakes to prevent their succulent stems from snapping in half. Sorry I’m not believing this flower list. I have many of them. If they are so dangerous why are they allowed to sell them. What a load of tosh! however it has saved me from going out into the garden for a wee dig and a nibble on my bulbs buried 4 inches in the ground! Anyway can’t chat need to get my foxglove lilly of the valley pesto done! But first I just have to get rid of the panda salesman trying to sell me some dodgy bamboo! Silly! These are generally not garden plants these belong in the flower bed except for mint. Mint will spread but smells lovely when I mow.